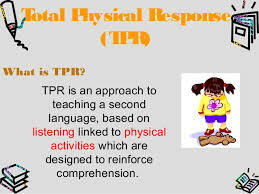 Richard and Rodgers (1986: 87) state that TPR is a language teaching method built around the coordination of speech and action; it attempts to teach language through physical (motor) activity. Garcia (2001: 1) explains that the two very important concepts in TPR are the notion of Total Physical Response involvement and the role played by the right hemisphere of the brain in learning a second language by action. The first concept deals with the idea of introducing second language by giving action response which has been influenced by the way people acquire their first language. A baby would not memorize a list of words or try to speak immediately. Garcia explains further that the TPR approach is a right brain method of learning a language because the language is taught mainly through actions. In the other words, commands play as the core of the course. TPR is also named the comprehension approach since of the importance given to listening comprehension. In TPR, students listen and respond to the spoken target language commands of their teacher. If they can perform the teacher’s instructions it means that they know the meaning of the words. Total Physical Response Method also called the comprehension Method was evolved by Asher, an experimental psychologist. The method bases its principle on the way a child learns his first language. In the process of the first language acquisition, the child listens to a lot of language sounds before attempting to speak. In this process, the child follows commands. He or she listens to the language in the form of parental commands. Belum ada tanggapan untuk "Total Physical Response (TPR)"